It Was the Fat Guy. No, Wait: The Bearded Guy. At Least He Was Franciscan! Amanda and I completed a test playthrough for the first time tonight of a game quite like a shaken-up adaptation of Clue: Mystery of the Abbey. We’d been looking at it for some time, especially liking the theme of the game and the supposed changes it made to the standard “murder mystery” gametype, so this afternoon I gave it a buy and decided to see what it was all about. Due to the deductive mechanics of the game, Mystery of the Abbey requires at least three players to function, so for our test run we decided to each take the place of two players and see how the game ran with four. I doubt we will try this methodology again, as it was quite confusing to keep track of which hand (left or right) knew what, and to not conflate the knowledge of the two sides for an unfair advantage. As it was, I ended up making an incorrect guess at the end of the game, and Amanda made a correct one. She would have won the game anyway, as I had been barking up the wrong tree for most of the game and didn’t even have the right suspect. Mystery of the Abbey is played much like Clue. The basic premise is the same: the titular abbey is a waystation for pilgrims on their journey, and one of the brothers has been found murdered. It’s your job to find out which one of the other brothers committed the heinous deed, while making sure you attend the Hours (here always called Mass) and asking questions of your fellow monks. As with Clue, at the beginning, a suspect is drawn from the pool of cards available at the beginning, and then the remaining cards are distributed to the players (with a few cards held over to provide incentive to hit up one of the special rooms on the board). Players must ask questions of each other to attempt to deduce the true killer, then enter the Chapter Hall and make an accusation. The cards you have in your hand can—and will—move from one person to another through the course of the game. Other than the cards you draw, which are largely tactical choices, there is little random chance in the game. You don’t move based on die rolls, you move a set number of spaces each turn. There are no weapons and no rooms. The only thing you have to guess is which brother committed the crime‚ AND the person who guesses the killer may not always win the game (more on that later). In our four-player game, each person started the game with five cards, so five suspects are marked off immediately. The game is played in cycles of four turns. In each cycle, the turn order is different in that a different player goes first. Was is Colonel Mustard, in the Study, with the Knife? The result of this questioning is usually that you get to see a card from an opponent’s hand. This system has always been open to a certain amount of psychological warfare, as whenever I play Clue, I tend to always ask for things that are in my own hand just to fluster the other players. Do you have Father Matthew cleared on your list? How many fat Franciscans have you checked off? Do you have any Templar novices in your hand? When questioned, a player can either respond with the answer (and you must answer truthfully), or they may respond by saying nothing and invoking their “vow of silence.” If they refuse to answer, nothing happens. If they given an answer to your question, however, they have the right to immediately ask a counter-question, and the counter-question may not be dodged. The second question has to be answered truthfully. The Chapel is where all the monks end up every fourth turn, as Mass is called (the game even includes a little tin bell to ring for Mass). It’s also the starting square, which is a lot better than the coat closet. The Confessionals (there are two) provide an opportunity for players to steal cards from other players. 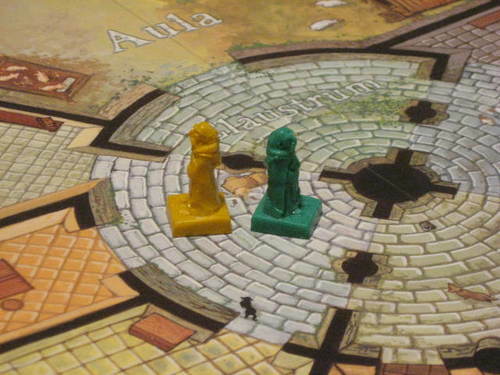 At the beginning of the game, two dice are rolled to determine a color for each Confessional. When a player’s token enters one of these spaces, they get to take a card at random from the player whose color is showing on the die resting on that Confessional—but then that player has to turn the die to his color (so the next person entering gets a card from his hand). Cells are colored spaces that belong to each monk trying to solve the mystery. If you enter someone else’s Cell, you have the right to take a card from that person—but if that person ends up walking into their own Cell while you’re in it, you have to go back to the Chapel and lose a turn as penance. The Scriptorium allows you to draw a card from a pile on the board. These cards have certain effects that are always beneficial to the person drawing, such as gaining cards from someone else or adding a space to your movement on a following turn. The Library is a space you can only enter if you have the least number of cards in your hand compared to the rest of the players, and you can only enter once per game. You get a special card that has an immediate effect (the one I drew made me swap hands with another player). The Parlor allows you to draw one of the set-aside Suspect cards from the beginning of the game, or to ask a “Go Fish” styled question in order to see a card someone else is holding. The Crypt is a dead end and usually means giving up your entire cycle of turns, but you can enter once per game and take a card that gives you a double-turn later in the game. The Chapter Hall is where you make Revelations and Accusations. As you can see, there’s a lot to do. In most turns, you are only going to be able to make it to one or maybe two of these rooms. I would figure that you’d get to two most turns in a six-player game, as you gain a third movement point each turn, rather than just two. Every fourth turn, all the figures (unless you have a special card or two) gather back in the Chapel for Mass. At Mass, there is an exchange of cards, which grows by one each turn. (The first Mass makes you send one card to your left, then two on the eighth turn, three on the twelfth, and so on up to six cards, which would usually be your whole hand.) You also turn over event cards, which either cause something to happen immediately or change the game slightly for the next cycle of four turns (example: all requests must be given in plainsong for the next four turns). In general, your goal is to both see as many cards as possible and to ask questions that give you information, but don’t give anything useful to anyone else (as everyone can hear the answers given at the table). A lot of the additional stuff is secondary, but many of the cards can have game-changing effects, sometimes giving one or more players a lot of additional information they didn’t have. The culprit is a Franciscan. The culprit has a beard. Each Revelation can only be made once, and players have to keep track of them until the end of the game. When the culprit is revealed, Revelations score +2 points if they are right and -1 point if they are wrong. A very good guesser or extremely good deducer could score six point with Revelations alone if they were fast enough (they have to be made in the Chapter Hall, and you can only get there likely once per four-turn cycle). An Accusation works just like Clue, with the exception that a missed guess doesn’t knock you out of the game. If you’re wrong, one of the other players simply reveals that card from his hand, and you love two points. A correct Accusation is worth four points. Because there are different ways to win and the suspects are laid out in a very different kind of matrix, the strategy is way different. Free-form questions change things a lot. In only one play, I think the most important thing to keep track of is which cards that have passed through your hands have also been seen by the other players at the table. In a six-player game, you’ll likely only be able to keep track of those on your immediate right and left, so it might not prove to be as useful, but with three or four, it’s the most obvious thing to track. I also think the dynamics of the game would become very different with six players. It would certainly be more chaotic, and it would take you longer to see more of the cards. There’s a lot of bumping into each other in the first two turns of a cycle, so most of the questions would be answered quickly in a turn and give others time to hit things like the Cells to see more cards from specific people, or to make Accusations within the same turn. Overall, I think it’s a much better designed game than Clue and would be fun each time. There’s a certain ecclesiastical humor about it that I enjoy, and the theme does work quite nicely for providing different “Guess Who” style differentiations between the suspect types. I could see the cards getting in the way if there were several unlucky draws or nasty cards that ended up getting played in a row, but it would provide for a good game to sit around and converse over and didn’t take all that long to play to boot. I’m definitely looking forward to playing this in a larger group. I think it will take a game or two to nail down a strategy for it, but I’m impressed with the thought that’s gone into it and think there’s some pretty deep strategy (for instance: I discovered in our first play-through that the questions you ask on the first turn won’t be the same as the questions you would ask on later turns).